This is a 4 Cue wireless firing system for fireworks and pyrotechnics. 4 x 1 Cue receivers. 1 x 4 Button Transmitter. Any receiver or set of receivers can be programmed to fire from any button on the transmitter. We can supply any number of receivers or transmitters to your requirements. Please also consider our 12 Cue System with transmitter and protective case. 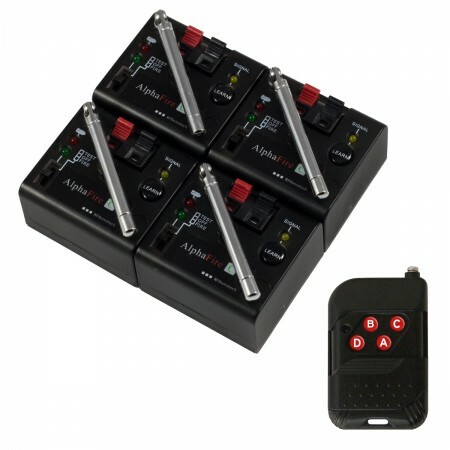 This system allows you to fire multiple fireworks in multiple locations from one transmitter. Any number of receivers can be programmed to fire from any button on any transmitter. This gives a huge amount of flexibility when designing a show. Button A = Fire receiver 1,2 and 3. Button B = Fire receiver 4. Button C = Fire receiver 5 and 6. Button D = Fire receiver 7. The distributed system is ideal for confetti effects or fountains fired simultaniously on banquett tables, stage pyrotechnics or simulated bullet hits on actors. Each receiver is user programmed to securely "learn" a transmitter button. Pressing the button then fires all receivers that have "learned" the transmitter. Sliding safety cover on the fire buttons prevent accidental use. Safety light indicates when the terminal is live. 6 volt output will easily fire a single 12 volt effect. Up to 200 m / 660 ft clear line of sight. The receiver has a low battery indicator. Each receiver can standby for over 24 hours.